In this remarkable proto-science fiction story from 1666 — which also bear striking resemblances with modern fantasy — the author Lady Margaret Cavendish explores an allegorical and satirical world, which she finds through a portal at the North Pole. The bizarre beings in this world need to understand the true meaning of science and philosophy, which Lady Cavendish provides them, and thus she becomes their empress. The Description of a New World, Called the Blazing-World criticize and explore such issues as science, gender and power. The natural philosopher, author and poet Margaret Lucas Cavendish, Duchess of Newcastle (1623–73) lived during the scientific revolution and participated in this brand new world, with contemporaries such as Descartes, Leibniz and Newton. One of her correspondents was the astronomer Huygens. She was the first — and during a long time the only — woman who was allowed to attend a meeting at Royal Society of London. 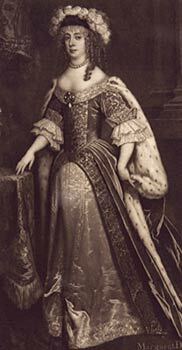 Lady Cavendish was viewed by her contemporaries as being rather eccentric. She was extravagant and flirtatious, accused of using speech full of “oaths and obscenity,” and was noted for her unusual sense of fashion. Today, she is honored as an original, unique and clear-sighted thinker, as well as an early feminist.